Bread, the staff of life. So many varieties to choose from that you could eat a different type of bread every day and never run out of choices! I am by no means an experienced bread baker and I had “zero” experience of baking a sourdough loaf until 2 weeks ago when I made a plain white bread sourdough. I found out how much fun that was and decided to branch out and try making a Sourdough Rye Bread. This recipe comes from the King Arthur’s Flour website and it turned out absolutely fantastic! 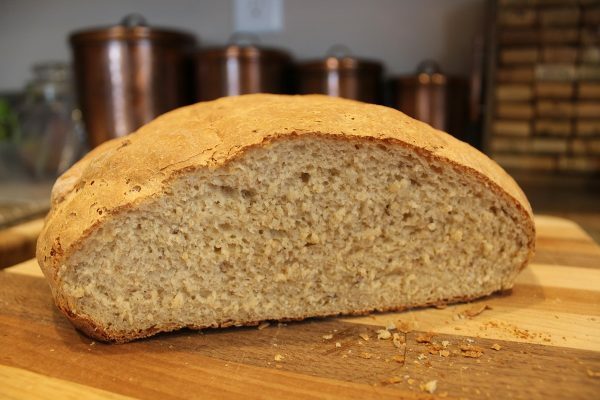 Wonderful light tangy flavor with a touch of Rye and Whole Wheat. We loved it hot from the oven slathered in butter and even better the next morning, toasted and buttered. Sourdough bread making is a process. 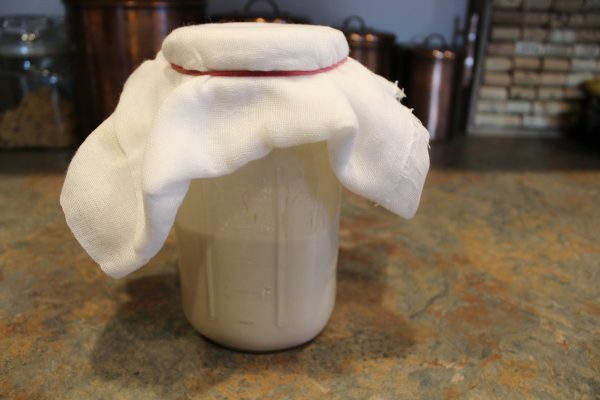 A process that begins with a Sourdough Starter that has to bubble and brew for a few days. Once that is ready, you have to “proof” some of the starter overnight in a warm area until it too, is nice and bubbly and has that distinctive Sourdough aroma. Basically it smells…well….sour 🙂 When the proofed starter is “ripe,” then it is time to bake bread. The idea is then to keep the remaining Sourdough Starter by feeding it so the next time you want to bake a loaf, you just pull the starter out of the refrigerator and begin to proof another batch. You can use your Sourdough Starter for lots of things like pancakes, waffles, rolls and many different types of breads. Sparky had a bottle of Sourdough Starter for 14 years! He never made bread but he could have if he wanted too. LOL! He had to discard it when we moved to Germany but now that we are home and in our new house, I decided to try my hand at baking this unique and delicious bread. We were 100% satisfied with the results and will be baking this one again for sure. The only misstep was not judging just how big the loaves would rise while baking. So I ended up with conjoined bread twins! Note to self: Buy a bigger baking sheet. But the bread still baked beautifully. Ready? Let’s bake bread! This is what we’ll need. 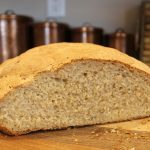 This tender loaf is lighted flavored with Whole Wheat and Rye Flours, then beautifully scented with Cardamon and Caraway. The original recipe called for a teaspoon of Anise Seed too but I left that out. Just a personal choice. You can make one gigantic loaf or as I did, two, still rather good sized loaves. 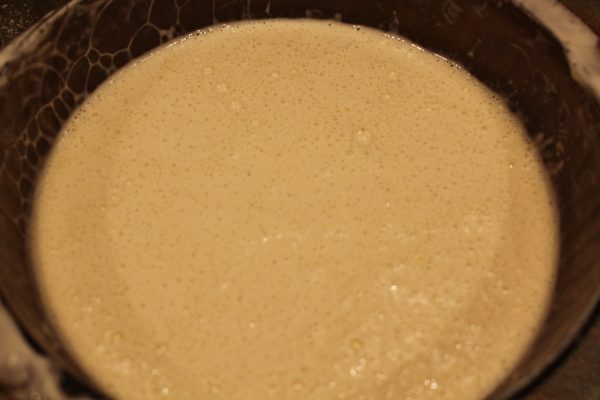 1 TBSP Instant Yeast "Rapid Rise"
First you need your bottle of Sourdough Starter. To "proof" the Starter, measure 1-1/2 Cups Sourdough Starter into a warm 2 qt non metallic bowl. Refrigerate the remaining Starter. To the bowl add 1-1/2 Cups of Flour and about 1 Cup of lukewarm water ( not over 85°) and mix well. It should be like a light pancake batter. Cover the bowl lightly and let it proof for 12 hours or overnight at 85-90° I use my oven with the oven light on. Worked perfectly! When ready it should be bubbly and have a strong sour aroma. This is what the "proofed" or "ripe" Starter looks like after 12 hours. Measure out the 2 Cups the recipe calls for return the remainder to the bottle of Starter. 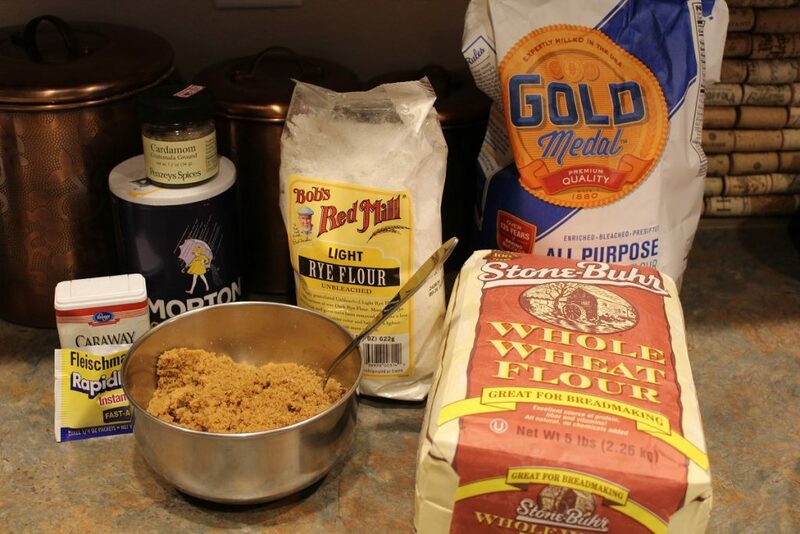 In a large bowl combine the Yeast, Milk, Proofed Starter, Brown Sugar, Cardamon and Caraway Seeds. Beat together using an electric mixer until you have a smooth batter. Add the Whole Wheat Flour and mix on low until combined. Then add the Rye Flour and continue mixing on low until combined. Gradually STIR in the AP Flour, one cup at a time until you can't still in any more Flour. The dough will be a sticky mess but that's OK. Turn the dough out onto a floured counter top and knead in as much of the remaining AP Flour as you can. The dough will be a little tacky but not sticky or sticking to the counter top. 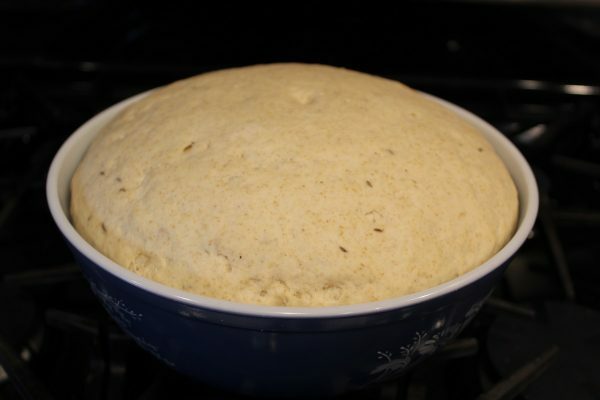 The dough is ready for rising when you can poke your finger into the top and the hole remains. 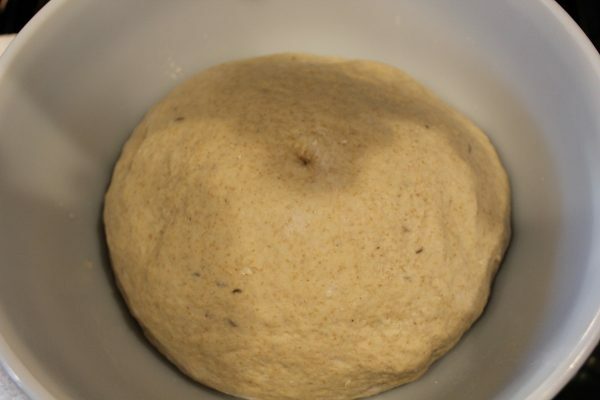 Grease a large bowl and place the dough into the bowl, turning it over once so both sides are greased. Cover with a clean tea towel and place in a warm place to rise. Again, I use my oven with the oven light on. Let it rise until doubled in size about 1-1/2 hours to 2 Hours. Gently deflate the risen dough by pressing it with your fist. Cut the dough in half and shape it into a ball, then place each half on a floured baking sheet. Cover the loaves and let them rise for another 45 Minutes. Make 2 shallow slashes with a sharp knife across the tops of the loaves. Pre heat your oven to 400° Bake for about 25 Minutes until browned on top. Give the top a thump or 2. If it sounds hollow, then the bread is done. Remove the loaves to a wire rack and let them cool a bit before cutting. And that my friends is Karen's version of Sourdough 101! If I can do it then so can you and the results are so worth it. Plus, once you have mastered one of these you'll be surprised at how easy the process becomes. Thanks for stopping by today friends. 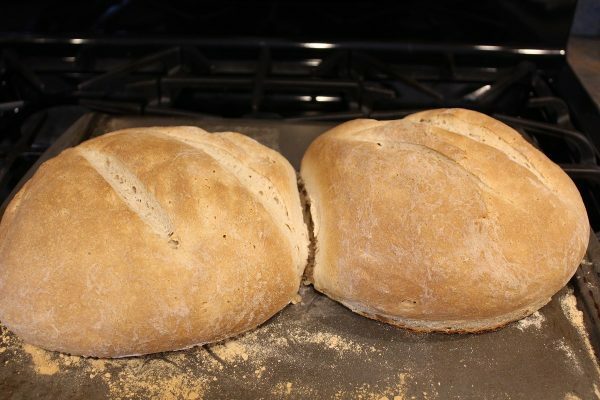 I do hope you will give Sourdough Bread baking a try. Nothing makes a house smell so welcoming as a loaf of bread baking in the oven! Stop by my website and leave me a comment. I love hearing from you. www.thejourneygirl.com Journey On!